As per the last world cup, but this time more interactive, and theoretically better. The axes show the goal difference in the final group games. The flag shows the team that ought to be in the place. This cannot show where two teams are equal, and therefore puts the team with the current highest goals scored - taking into account the minimum ascertained from goal difference - in the highest place. Another match in which the commentators have fallen over themselves to praise Australia for their ability to concede easily, while looking occasionally threatening. The Netherlands set up in a similar formation to that used against Spain, and it led to exactly the sort of frenetic long-passing game predicted. The down-side for Australia is that leaving, as Michael Cox noted, "a series of 1 v 1 battles all over the pitch", played into the hands of the Dutch strengths: van Persie's skill and Robben's pace, and a lost-ball and missed lunge was sufficient for an early concession. Netherlands playing five at the back also made it theoretically more difficult for crosses to find their mark, but Cahill came up with something remarkable to immediately equalise. His play in the two games making you wonder if his career in the midfield has wasted a natural number-9, good at getting on crosses and holding the ball up. Unlike Spain, conceding Australia possession is dangerous, as they put numbers forward and have pace on the wings. Australia should have scored with Bresciano, and later Leckie - though that was on the break. Those chances are ones Australia can ill-afford to waste, especially as defensive errors continue to haunt. The Dutch switched formation and had more of the ball, particularly Sneijder and Depay, the latter knocking a simple ball to an Persie when he was played onside and scoring from distance when not shut down. All told, Australia scored two relatively fortunate goals - a brilliant volley, but don't count on it, and a penalty - and conceded three from sloppy back play against a side who could afford to wait for those opportunities, and knew they could take them. As good as it looks to be streaming forward, there is a naivety in Australia's approach; a looseness that allows good teams to cut them apart, and there aren't any sides in this world cup with the quality to overcome conceding two soft goals (or more) per match. Spain lacked any of their usual verve and movement against Chile, but it would surprise if they can't find something for this game. If so, Australia will offer them plenty of small openings, and a blowout is entirely possible. Their lack of pace can be exploited though, and Australia has shown glimpses of quality in this world cup. It would be out of character for them to leave anything on the park. Missing the chance to do a preview prior to the second test had its advantages: not least, the natural tendency to over-state the meaning in New Zealand's first test victory. This was a dominant performance, for the first three days, anyway. Centuries by Williamson and Neesham backed by 80s by Latham and Watling, got them to 7/508 in the first innings, the wickets being shared amongst Benn and Shillingford. The old guard of Gayle 64 and Chanderpaul 84* provided the only resistance to Southee 4/19 (16) and Craig 4/91 in the second. With two days to play with, fast runs and an inevitable win seemed the likely result. But the runs were neither fast nor plentiful, and it was Taylor and Roach taking the wickets, as New Zealand slumped to 8/156 before declaring. This didn't matter, as only Shillingford's 29 ball 53 stopped it being a rout to Southee, Sodhi and Craig, whose 4/97 rounded out a good debut. But it showed the West Indies at least had the potential to cause damage. Jerome Taylor had not played test cricket for five years prior to this series. Yet, with Roach, he was one of the few West Indians with superior figures to the apparently inadequate bowling of Darren Sammy. He is, at his best, a match-winner, with a test century under his belt to boot. Latham's 82 set a platform to put on another sizable total for New Zealand, but after Roach removed the opener just prior to tea, Taylor 4/34 ripped out the middle order to dismiss New Zealand for 221. Like Taylor, Darren Bravo is a match-winner, but one the world is still waiting to fulfill his talents. He lacks he discipline to choose his shots, and that will keep him down, until, if ever, he learns. But he will have his good days, and his 109 was one. Along with Brathwaite's 129 and other contributions the West Indies for to a 239 run lead, with plenty of time, even with rain threatening. Roach's 4/74 was the pick of the bowling in New Zealand's valiant 331 off 152 overs. They took the game until the middle of day 5, and left a tempting target of 95 that Gayle (80 off 46) made short work of. Deservingly, this series will have a final match to decide it. It's a pity it won't garner the attention a topsy-turvy contest between closely matched sides deserves. There was much comment made that this match only sparked to life in the final session, but it offered an interesting tactical battle throughout. Sri Lanka demonstrated the benefit of choosing to bowl first even when the opposition scores heavily, with a Sangakarra master-class in batting (147 and 61) leading them to a deserved draw. With little on offer after the opening session, Sri Lanka resorted to short-pitch bowling in an attempt to remove Prior and Root - whose 200 not out showed again his talent, once he gets in. It worked, in the sense that it took wickets, but failed, in the sense that it also allowed the lower order to take 195 runs off the last 32.3 overs. That pace, when Sri Lanka had already been batted out of the game without something remarkable would almost come back to bite them later. The pick of the English bowlers was Jordan, whose arm-pumping run-up and bruising short pitched bowling, reminiscent of Patrick Patterson, kept them going through the long partnership between Mathews and Sangakarra, and produced one of the more comical dismissals of recent times when Pradeep fell on his wicket before he could be bowled. England's third innings was fast enough, given Herath took out the middle order, and a chase of 300 odd in a day was potentially very doable. The top-order continues to fail. It was hidden by Prior in the first innings, and the declaration here, but they need more than one batsman to get going: Bell and Cook in particular. The last day was a fight. The pitch offered little. And after a relatively fast start, neither did Anderson (4/25 off 19) nor Broad (3/43 off 21) whose workload should worry the selectors. The absence of a genuine spinner was a problem, and Cook was loathe to trust Moeen Ali, but both openers bowled 50 overs in the match, and need to back up 6 more times this summer. It was Anderson who sparked the late collapse, and Broad who almost stole it at the finish. Reiffel is clearly still a paid up member of the bowler's union, letting Herath walk with his hand off the bat off the first ball of the final over; and gunning Pradeep off an inside edge on the fifth to set off premature English celebrations. In the end, Pradeep's final-ball edge fell a few feet short of Jordan at slip, and Sri Lanka escaped. They'll be lucky to do so again at Headingley, where the pitch and skies are friendlier to the bowlers. Tournaments are coming thick and fast. Andrew Nixon (@andrewnixon79) and Russell Degnan (@idlesummers) review the ACC Elite, won by Singapore, the Pan European T20, won by Malta and the North Sea Pro Series. Andrew speaks to former Irish international and current Danish coach Jeremy Bray about the upcoming World Cricket League division 4. And there are also previews of ICC Europe Division 2, and the Scotland and Netherlands ODIs. Finally, we discuss private tournament ownership, and the lack of ICC (and member) development in women's cricket, amongst other news from Ireland, Nepal, USA, and Uganda. Direct Download Running Time 61min. Music from Martin Solveig, "Big in Japan"
Expectations were low at this world cup. After the maulings by Brazil and France that led to managerial change and the grim acceptance that the old guard was done, and the group draw that could barely have been more difficult, none thought Australia anything but rank outsiders to progress. A draw in any game would perhaps count as a success, a good showing sufficient to provide hope in a young side. Against Chile, we got the latter, but we shouldn't be happy. To anyone that asked I said we'd probably come away from the first match asking "what if". This wasn't based on prevailing form but a long history. Australia rarely fail to rise (or fall) to their opponents. They've done so against better teams than Chile, with less technically accomplished players. But they also rarely fail to concede soft goals, or come away from the inevitable defeat with the local media back-slapping them for going toe to toe with a superior teams. Here is the point though, one I've made before and will again: unless you get the result, who cares? Honourable losses still see you to the exit. And what-if losses based on a persistent failure to keep the opposition out aren't that honourable. They are a failure to reach your potential. Australia could not have started worse. Whether for nerves or the raucous Chilean anthem, it took two concessions before they managed more than two controlled touches. The immediate turnovers making it easy for Chile to maintain a press even in the heat. Both goals combined some Chilean skill with defensive panic. The first should never have led to an open shot, the second had two defenders chasing one man. Two mistakes, two goals. Even the best team in the world would struggle from there. Fortunately the goals seemed to give Australia time to regroup. Theirs is a simple tactic. Get wide where they have pace and space; cross to Cahill. But Bresciano is the key. The only player capable of killing the ball in traffic and distributing. He is let down by too few players finding space close enough to provide an outlet or quick return ball. Once he worked his way into the game, Australia was matching Chile through the midfield. For the next hour, Australia, as widely noted, played well, and in the manner of socceroos teams gone by: aggressive (both Milligan and Jedinak were booked), fast and dangerous on the cross. They have little else and Chile eventually shut down the distribution from the wings. Australia were arguably unlucky not to equalise by then, but this is the tactic of a side who holds firm and wins on the break, not one chasing the game. Chile could afford the extra defenders. What Postecoglou will do against the Dutch is a mystery as they are set up to completely negate Australia's width, and their three man attack will feast on errors. Against Spain, and in the warmups they played the ball quickly from deep, which could signal an ugly, but frenetic game if both sides abandon any sort of buildup through the midfield. That could suit Australia. Despite the opening matches, the Netherlands remains Australia's best chance of a result. Watching the world cup is a complex business. There are too many games at too many odd hours to watch everything and remain gainfully employed, but it can be hard to decide whether to stay up late to watch an obscure CONCACAF side play a European superpower, or crawl out of bed for a showdown between a pair of star strikers and their traffic cones come team-mates. the total change in probability that each team will qualify for the next round based on the result of a single game. Total meaning being calculated for all four teams in the group, for each game. Match probabilities were calculated using the Elo Ratings. Historically, draws are normally distributed around the rating difference: ~40% for evenly matched teams, with a standard deviation of 200. The win/loss probabilities are taken from the Elo formula on the site. We know such an approach is a good thing. There is an obvious correlation between that and success, though which is the chicken and which the egg is debatable. The need for stability is always the catch-cry of teams struggling, and players fearful of their places. It has been an article of faith that Australia built their dynasty around youth in the 1980s, though even that might need some revision. The longest period of batting stability for Australia immediately followed the 1989 Ashes, with only the substitution of one Waugh for another in 21 tests. But it was also a period marked by weak opposition, with the only losses being in NZ and to the West Indies (2-1). The 12 tests that followed the enforced retirement of Geoff Marsh, leading up to the 1993 Ashes, was anything but stable, with 6 different openers, 4 different players at first drop and 6 more players in the middle order - 7 of you include Greg Matthews. The results? Only three losses, one in NZ, and a 2-1 loss to the West Indies. Another two top-order changes were made for the first test in 1993; as in 1989, Australia were 4-0 up by the final test. Perhaps results might have been better with more stability (a series lost by one run has a lot of what-ifs); or perhaps the opposition over-rides whatever difference might exist. It is reasonably unlikely that swapping the 6th best player for the 7th makes a big difference, though ongoing panic such that you select the 13th best, might. There is also some indication that making zero changes is better. In the short term, the best side is probably the one you thought was the best side. 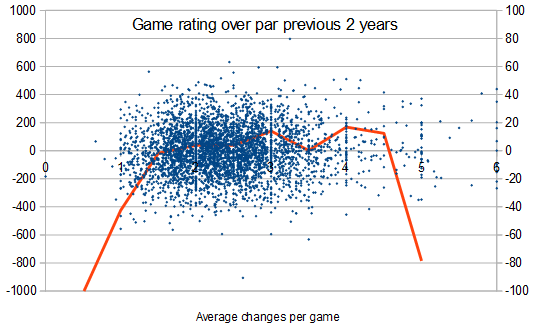 But making one or two changes is still likely to produce a (very slightly) above-average result - note that 20 ratings points equates to 10 around runs, a fifth that advantage conferred by playing at home. Though this doesn't necessarily solve Smyth's chicken and egg quandary, as a result above expectations may merely represent below average expectations. It gets more interesting when we look at changes per match over the previous two years. A side in constant flux ought to under-perform relative to expectations, if stability matters. Actually, we don't see that. 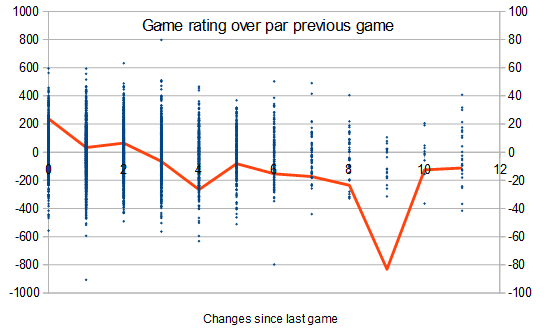 There is a lot of noise, and the difference is minimal, but sides making fewer than 1 1/2 changes per match do worse than expected than those making more. I'd proffer two possible explanations. Firstly, that there is an information problem, in finding the best set of cricketers, and most likely some benefit in trying several out until one shines sufficiently to become more permanent. And secondly, that stable sides are more likely to be older sides - established, successful - and therefore more likely to be declining in performance. That doesn't mean an alternative player will perform better though, particularly in the short term. As the game to game suggests, more often than not, the best players a team has are those who've proven to be the best they have, even when they are losing. If the last three months have been a fore-telling of our dystopian test-cricket-free future, the next will be a further demonstration of our dystopian context-free present. The West Indies ought to have a lot to play for in this series. In theory New Zealand are their most closely matched competitor, and one they should defeat at home. But while New Zealand had a credible home series victory against India, the West Indies have lost four of their last five tests, three badly, two in the reverse tie, and needing no small amount of fortune to draw the other. But the WICB's hard stance of Narine, forcing him to choose between the IPL final and the test series, and his (probably sensible) decision to stay in India, hints at the low-key nature of the contest: another obligation, easily forgotten, to fulfil between the IPL and CPL. No matter. With the pitches likely to be slow, and perhaps high scoring, the key will be whether New Zealand can combat the West Indies spinners. Their own bowling, while likely to be less effective than at home, will keep the opposition honest, but they also need some of the high scores they produced at home. Rain is likely in the first test, and that would indicate a draw. But the home side is extremely unpredictable, and they are relatively well matched, so don't rule out the alternatives. Speaking of obligations. England are obliged to play seven tests per season for their broadcast partners, and to host the world's less lucrative teams as well as India and Australia. Not that Sri Lanka seem desperate for more test cricket. They have, to be fair, played five tests so far this year, splitting a series against Pakistan they ought to have won, and defeating Bangladesh one-nil. That followed only three tests in 2013 though, with none between March and December. It may be the pitches, but their bowling has had recent phases where batsmen have scored both quickly and without fear, helped significantly by the captaincy. The batting has been prolific, despite the gradual decline of Jayawardene, Sangakarra seems to relish the rare opportunities (or the Bangladesh bowling). England are an interesting problem for any previewer. A year ago they had a stable top-6 and their most experienced ever bowling attack. Now they have Cook, Bell and if he can find form, Root, a recalled Prior, and if their body lasts, Broad and Anderson. A radical shake-up can be good for a team, if they've been under-performing, and if the replacements are better. Both, possibly are true statements too, Pietersen aside, as in Robson, Moeen Ali they have some definite talent, and Plunkett, Jordan and Ballance are not noticeably inferior to Bairstow, Borthwick and Rankin. They will miss Stokes, as he was perhaps the only player to emerge from the Ashes with any credit. But they also probably don't need him, at home, against Sri Lanka. This series will be seen as a useful, not overly challenging, test, one the players will either pass or be easily moved on as a consequence of. That will be unfair on the players, as luck plays its part, as does the environment. The one player that should be watched closely is Cook, now charged with forming a new side in his image. His record with inexperienced players to date has been execrable; and he no longer has dependable support if he does so again. A quieter week so Andrew Nixon (@andrewnixon79) and Russell Degnan (@idlesummers) hit a few big issues. Firstly, news from the ICC on the distribution of places for the next WT20 qualifier is bad news for Africa, America and Europe; but teams in WCL4 and above are still in the running for I-Cup and WCLC places. Worst off of all are Americas women, currently deprived of a pathway to qualification. Andrew talks to Durriya Shabbir from the Canadian national team, about Women's Cricket Now, and the lack of support from Cricket Canada and the ICC. We then turn our attention to match fixing, discuss the potential risks at associate level, and why it needs to be taken more seriously. Finally there is the normal USACA news, reviews of the ACC Elite Trophy and the Pan European Cricket Tournament. Direct Download Running Time 51min. Music from Martin Solveig, "Big in Japan"